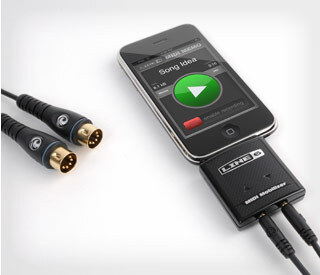 MIDI Interface for iPhone, iPad & iPod touch | MIDI Mobilizer | Line 6. The original MIDI interface for Apple iPhone, iPad, and iPod touch. Together with an Apple iPhone, iPad, or iPod touch, and the free MIDI Memo Recorder app, MIDI Mobilizer can play, record, and backup MIDI information any time, any place. Whether you want to capture a quick musical idea or back up the settings of all your MIDI gear, MIDI Mobilizer is the most simple and compact solution for everything MIDI. MIDI Mobilizer is compatible with all models of iPhone, iPad, and iPod touch.